I know, I know the last couple of recipes have been very indulgent. Creamy chocolate pudding and Dahi- Vada. What can I say, I really love them. Cheese, whole milk, elaborate process, whisking. This recipe is an exact antidote to that. One pot prep. Healthy. No added sugar. 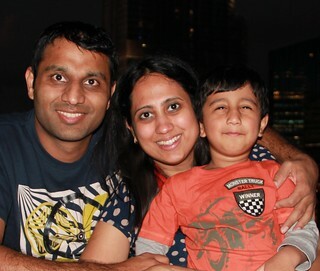 And Varun approved to boot. 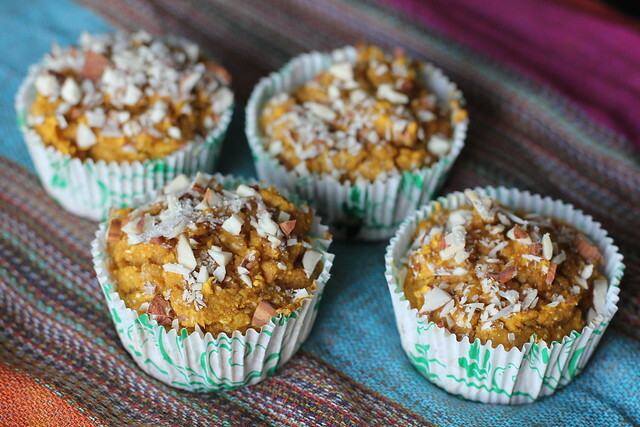 Cornmeal, pumpkin and applesauce come together in these muffins to create a naturally sweetened muffin which is great for breakfast with eggs ( or just coffee), after school snack or with chili for dinner. It has fiber, good carbs and protein. And did I say no oil, sugar or butter. They freeze well in an airtight container and are perfect to be made on weekend when your toddler naps or when he wants to help in the kitchen and you are ok with a little mess. Microwave when needed for a minute for a healthy snack with a pat of peanut butter or as is. 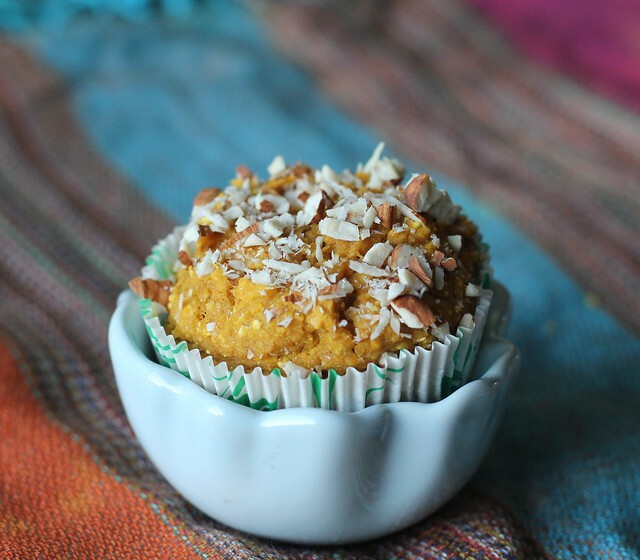 2 – 3 tablespoons chopped almonds, walnuts for crunchy topping. 1. 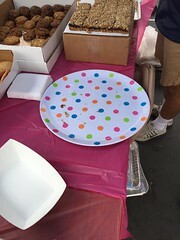 Pre-heat oven to 350 F. Line a muffin pan with paper cups. 2. In the meantime, mix all the dry ingredients ( cornmeal, flour, baking powder, baking soda and salt) in a large bowl or a stand mixer. Dump pumpkin puree, applesauce and egg in the same bowl. Mix well for couple of minutes ( by hand) or a minute, if using a mixer on low-speed. 3. Scoop the mixture in paper cups. Dust with sugar. Sprinkle chopped nuts. 4. Bake for 20 – 25 minutes till a tooth pick inserted comes out clean. Enjoy warm or frezee for later. The other thing besides Dahi vada, I was craving during last couple of weeks of pregnancy was a good old fashioned pudding. Made from scratch at home with love. Creamy, chocolately, that leaves a thick drape on back of the spoon that you want to lick. Puddings are really easy to make. But most recipes call for cream and corn starch; which I never don’t have on hand. When I am at Whole Foods, I pause at the fresh cream bottles, thinking that I can make a pudding with this today. Those Straus cream bottles are very inviting. In their cute shape, they sit right next to the milk gallons begging to be brought home. And made into pudding. But at 25% fat ( albeit good fat), I don’t really give into temptation and walk away as quickly as possible. Recently, I came across a Tyler Florence recipe using whole milk ( which is what we have switched to given the milk powder and other additives in low fat milk), I decided to give it a try. 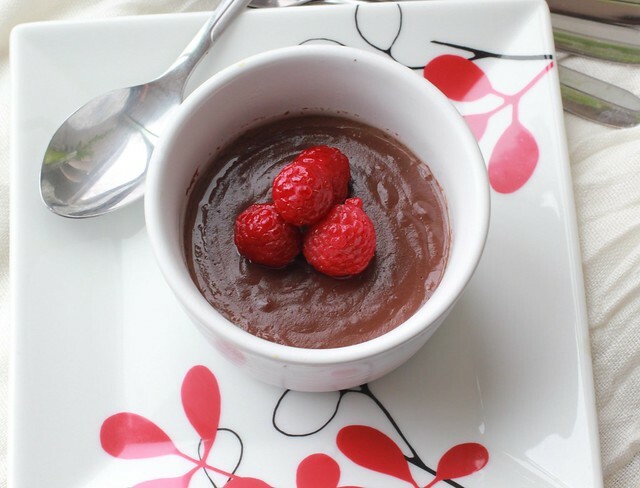 Low in sugar, this is a healthier version of chocolate pudding that you can otherwise make. Flour can be used in a pinch as a substitute to cornstarch. 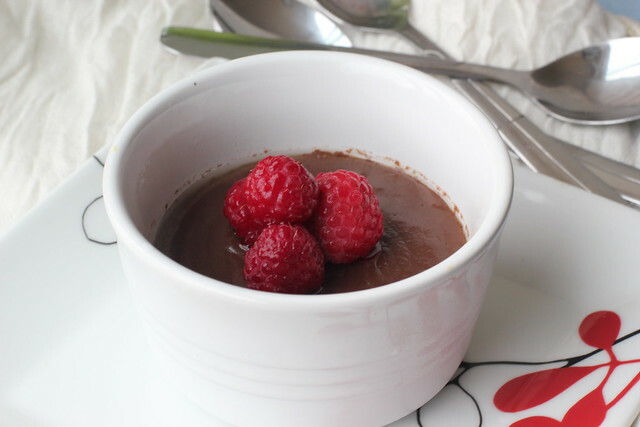 The result was a silky, creamy pudding as rich as the one made with cream. If you are craving a special treat this weekend, give this a try. You probably have everything you need in your house to make it right now. Its bound to surprise you with its ease and its taste. And its something you wouldn’t mind your kid indulging in. 1. Don’t use fat free or 1% milk for this. The resulting pudding will be thin and you may not like the texture. 2. Don’t skimp on whisking. It will reward with a smooth lump free pudding. Mix 1 1/2 cups of the milk, sugar, and the cocoa powder in an saucepan. Bring it to a simmer, over medium-high heat, whisking intermittently to avoid scorching the milk. Remove from the heat and keep aside. In the meantime, whisk eggs, flour and table spoon of milk, salt and vanilla in a bowl ensuring there are no lumps in the mixture. Add a tablespoon of chocolate milk from the saucepan to the eggs. Whisk till incorporated. Repeat with another 2 – 3 tablespoons of milk, adding one tablespoon at a time. This ensures that the eggs don’t get scrambled when added back to the chocolate milk mixture. Add eggs- milk mixture to the saucepan. Whisk it with the remaining milk and cook over medium-high heat. Whisk constantly until pudding comes to a full boil. Reduce the heat to maintain a simmer, and continue whisking until thick, about 2 or 3 minutes more. Pour the pudding into 4 ramekins. Cover with plastic wrap and refrigerate for at least 4 hours. Garnish with chilled whipped cream, raspberries or strawberries or grated chocolate. Pushpa: Le Dahi Vade kha le. Urmila: Nahi mann nahi kar raha. Bol ri! Kya naam hai unka? This is a classic scene ( copied from being desh blog) from a very popular oldie- goldie Hindi movie “GolMaal”. Its hilarious in its reasoning. 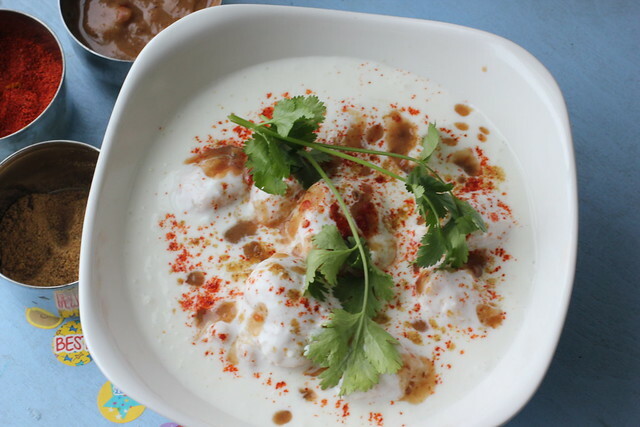 Dahi vada’s have been on my mind lately. At least since mom is here. And they always remind me of GolMaal. There is a reason why these are not on the menu of any and every Indian restaurant that you have visited. 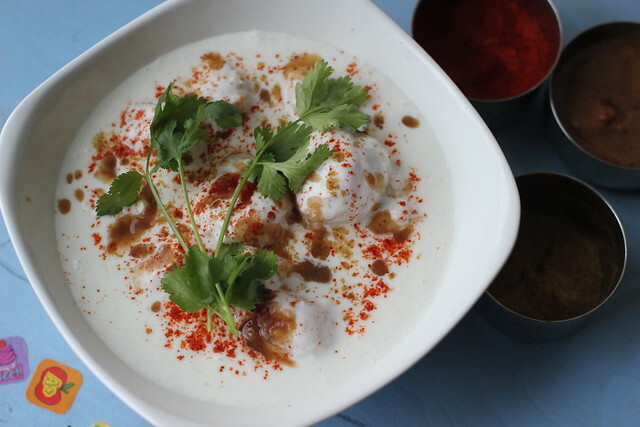 Unlike Saag Paneer, Chole or Alu- Gobi, dahi vada’s are tricky, need a lot of patience and muscular strength. The lightest,fluffiest melt in your mouth vadas are made solely by whipping the batter with your hands. Whip and whip till you feel that your arms are going to fall off. And then some. Then this fluffy batter is deep-fried in hot oil. Once golden brown, they are dunked in a buttermilk bath to soften the core and then immersed in cool tangy yogurt sauce. It is served with a variety of spices – cumin powder, red chilli powder and a tangy tamarind chutney. 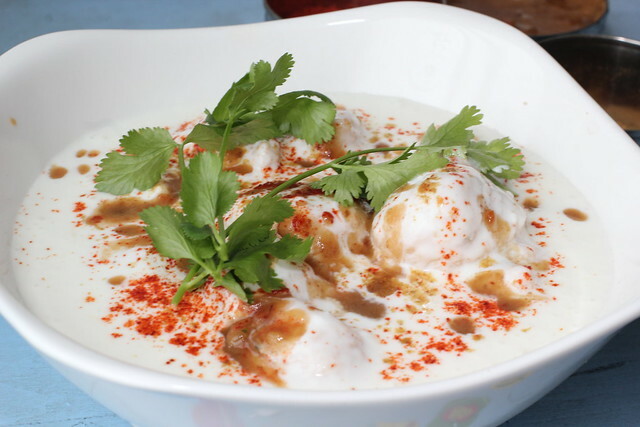 But once made and chilled, they are these lightly puffy yogurt soaked lentil balls that you will fight over. One bowl or serving will never be enough. At least plan on 2 to 3 servings per person. This is one recipe that is worth the effort. Every single time. Here is mom’s recipe below. 1. Wash both the urad and moong dal well ( at least 7 – 8 times in plenty of water) till the water runs clear. It will be milky at first and then run clear. Soak dal in plenty of water for at least 5-6 hours to overnight. 2. Discard water from the dal and finely grind it with as little water as possible. Set aside the dal batter for 1 – 2 hours. 3. In the meantime prepare the buttermilk bath. Whisk all the ingredients listed till you get a thin batter. Set aside in a large shallow bowl. 4. Heat oil in a wok on medium-high heat. Add salt and ginger to the dal batter. Whisk the batter with hand for at least 10 minutes in a flat plate. Whisk and whisk some more till you feel the batter to be light and fluffy. 4. Fry small golf ball sized vadas in hot oil till golden brown. Test one vada to ensure that the vada is cooked evenly through the center. If not, lower the heat and cook till they are golden brown. 6. Soak the vadas in buttermilk bath for at least 2 hours. Remove the vadas from the buttermilk bath and keep aside covered. They can be kept at room temperature. 7. Prepare the yogurt sauce by missing all the ingredients and adjusting to taste. Keep the yogurt in the refrigerator to chill till ready to serve. 8. When ready to serve, layer the vadas in serving bowl. Pour the yogurt sauce over the vadas. Garnish with chutneys and cilantro. Serve with additional bowls of chutney, cilantro, cumin and chili powder to add per taste. We have been on the healthy eating bandwagon since earlier this year. It was our only New Year Resolution, if you will. 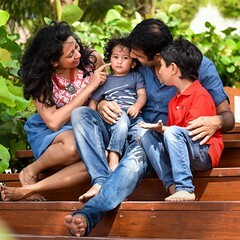 And although there have been occasional slips ( French-Creole food from Brenda’s, Fish curry from Gajalee and Vada-Pav from DOSA), largely we have stuck to the game plan. More veggies, moderate amount of protein, no sugar, no artificial processed foods and whole natural fat. After nurturing years of sweet tooth, its hard to go without a sugar fix. Thankfully two deserts have come to our rescue. 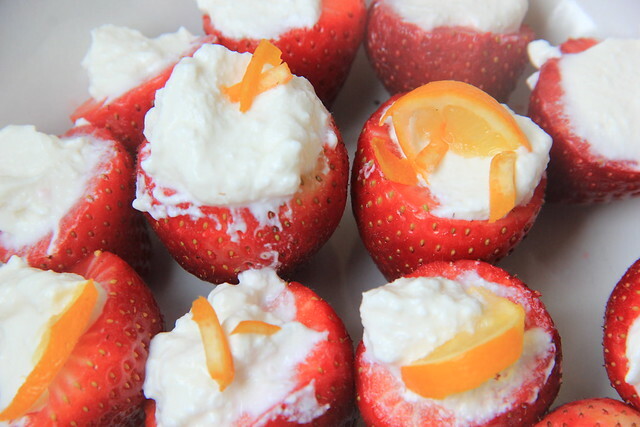 Ricotta stuffed strawberries and Oatmeal-applesauce cookies. Made with all natural ingredients both these desserts are naturally sweet. Now I know, sweet is a very relative term. My parents can’t have their cuppa of tea without a teaspoon or two of sugar in it. That’s their baseline. For me, more than half a teaspoon sugar makes it too sweet. Thanks to the south beach diet and the palate cleansing, we can actually taste the natural sweetness in vegetables – tomatoes, bell peppers and even squashes. Sadly that means we find traditional desserts at restaurants too sweet. 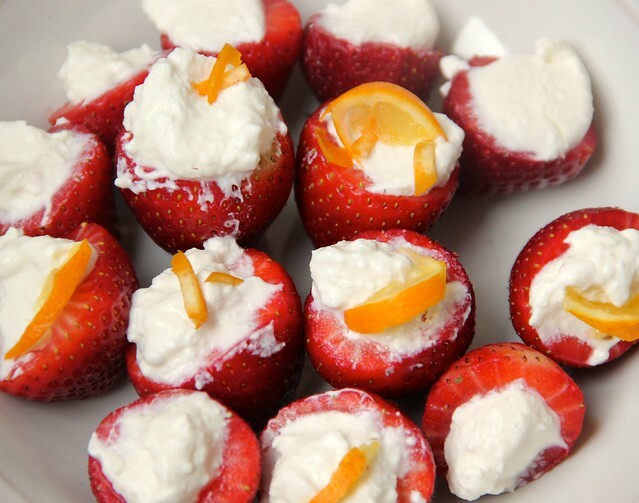 To indulge in our sweet tooth while still maintaining the diet, I made us some ricotta stuffed strawberries. I know strawberries are not in season but I got them on sale at Whole Foods so there they were. I am sure the ricotta would go well with grilled peaches, pineapples or whatever fruit is in season. This is a recipe where ingredients shine – so don’t buy the prepackaged ricotta which is grainier but get some freshly made ricotta. Whole Foods, Trader Joe’s and other natural food markets carry them next to fresh guacamole,salsa etc. Or make it yourself. There are tons of recipes online. I used to always think that bloggers who ask to get premium ingredients are snooty – but really after having this I change my mind. The fresh ricotta melts in your mouth. I added a little bit of maple syrup and Meyer lemon juice to the ricotta to brighten this further but it was good even as is. A take on strawberries and cream, this is one dessert that I think we can make over and over again especially once spring brings fresh seasonal berries. 1. With a light hand, core the strawberries and scoop out the flesh. Save it to make some strawberry jam. Set them aside in a serving dish. 2. Whip the ricotta cheese with 1 tablespoon maple syrup, lemon zest and juice. Taste and add more syrup if necessary. Whip again. 3. Using a small spoon (or pastry bag if you really want to be fancy and make swirls), spoon the ricotta cheese in strawberries. Refrigerate for couple of hours at least. Garnish with Meyer lemon zest. Serve chilled. I am on a smoothie kick these days. Mostly because they are so easy to make. Once I have fruits and veggies on hand, it’s just mix and match and then whirl in my Magic bullet. Single container. Easy cleanup. Tasty. And filling. I learnt recently that home-made smoothies are healthier than juicing as we retain the fiber in the smoothie v/s discarding the pulp. The fiber makes them filling and low glycemic index. I mean seriously whats not to love. I saw pear and ginger combination on Pinterest recently. Had it on hand and this came about. If a recipe can be so-called, then here it is. P.S. 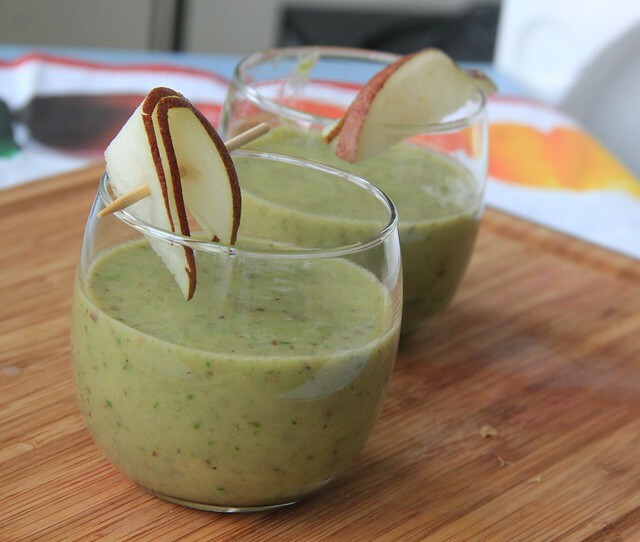 If you are looking for more smoothie inspiration, just check out Pinterest Smoothies board. There are tips and tricks, combinations and beautiful photos. 1. Swirl everything in the blender till well mixed. Are you on a smoothie kick? Which flavors are your all time favorites??? If there is one thing I didn’t know about San Francisco before the move, it is about its extremely fickle weather. It’s not like Seattle where it can rain anytime. Here it is extreme.The mornings that usually start with a roll of fog or cloud cover, make way for splendid sunny afternoons. Warm enough to be in shorts and sandals. And sunny days can give way to foggy afternoons. Yesterday it was 70 F and today its 48F.So locals tend to dress in layers. 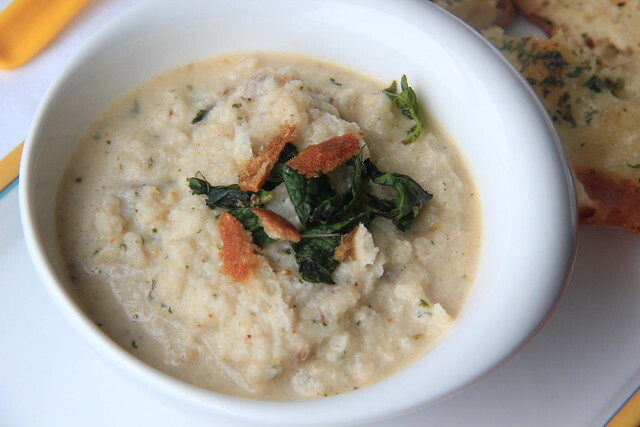 The fog and clouds brings chilly weather and it is perfect for soups. Pumpkin and sage, chicken noodle or even simple tomato and bell pepper. We had a lovely mussels in sofrito based soup over the weekend for lunch and ended the day with a hearty cauliflower soup. Creamy, cheesy and healthy. Not something you will see in same sentence. Usually. But its the milk that adds to the natural creaminess of roasted cauliflower here. Sum total being greater than parts. I have seen pinterest pictures of this being made with colorful cauliflower heads. I made with plain old white one. Mom was a little skeptical. She is used to standard normal tomato and clear broth soups. For her,vegetables are had stir fried with a little spices. Not with cheese and blended into a soup. This was too much of a paradigm shift for her. But we all loved it. Pre-heat oven to 375 F. Toss cauliflower with spices and olive oil. Lay it in a single layer on a baking sheet and roast for about 30 – 40 minutes till golden spots begin to appear. In a saucepan, heat the teaspoon of olive oil. Saute onion in it till cooked for about couple of minutes over medium heat. Add cauliflower, mint, salt and 2 cups of water. Mix well. Cook for another couple of minutes. 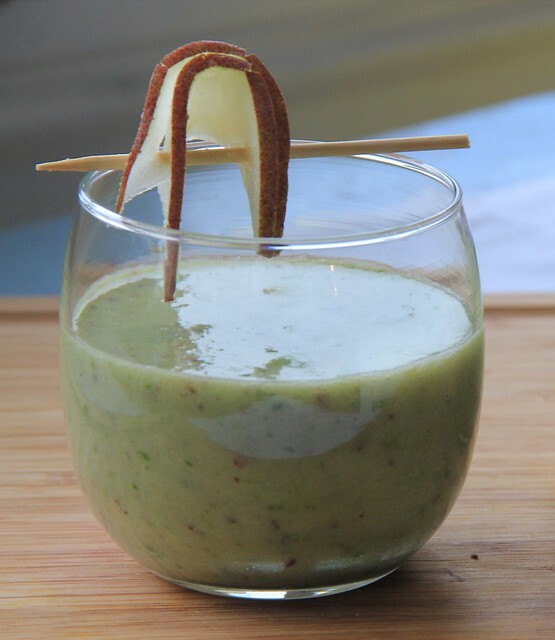 Using an immersion blender, blend the cauliflower soup. Else wait for it to cool a bit and blend in a regular blender. Hot liquids and blenders need to be handled carefully. Add milk and cheese. Mix well and cook for another minute. 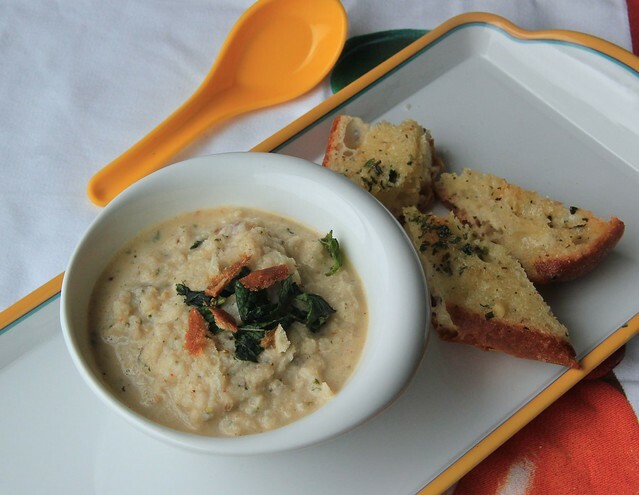 Serve warm with garlic bread.